We’re conveniently located in Oshawa, Ontario, Canada! 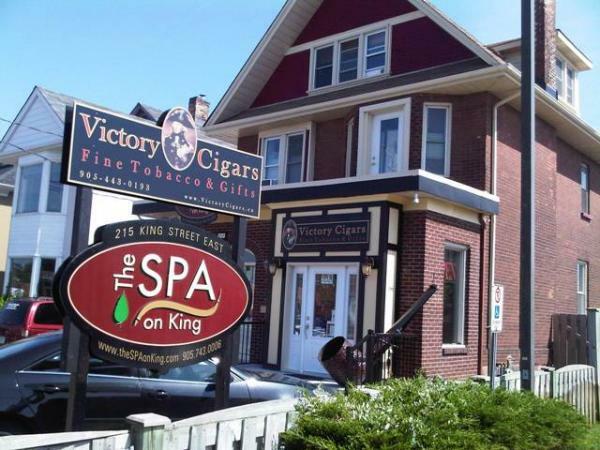 Located just around the corner from the courthouse, Victory Cigars has been well received by aficionados of fine cigars, pipes and pipe tobacco. The shop is open 7 days per week and offers a range of Cuban, Dominican, Nicaraguan and Honduran cigars. In addition, loose and packaged pipe tobaccos are available for purchase. Customers can also obtain fine pipes from such suppliers as Lorenzetti and Brigham. The store can satisfy the needs of novices or connoisseurs. The collection of humidors is a point of pride in the store, with models on display ranging from $49 to $700. Official merchandise from most of the well-known brands is in stock, and cutters, punches, pouches and ashtrays are all available at very reasonable prices. The most notable feature of the store is that the vast majority of the products are on display. Under the Smoke Free Ontario Act, only designated tobacconists may keep their wares uncovered. Victory Cigars is the only store in Durham Region to obtain this coveted designation. This year, if you can’t go to Cuba, remember: Victory Cigars can bring the best of Cuba to you. Open 7 days a week with free parking.